Nothing is more frustrating than getting your website hacked. Many of us just assume that if we install certain plugins and take certain measures, our sites won’t get hacked. In reality, the more layers of security you add to your website, the better off your site will be. 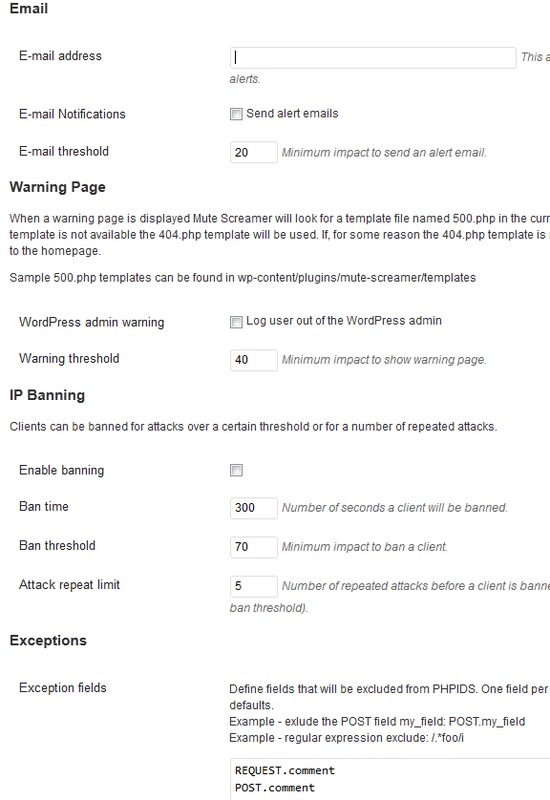 Since WordPress is a PHP-based solution, you can expect certain types of attacks to come your way. PHPIDS could help make your website more secure. Mute Screamer uses this technology to thwart attacks on your site. Mute Screamer keeps track of attacks on your website and sends you alert emails. You have the option to log out users when your site is attacked. IP banning is supported as well. You can update your exceptions under Exception, HTML, and JSON fields. The log system keeps track of all the intrusions. Keep in mind, not all the intrusions are malicious. You can see page, tags, IP, impact, and date for each intrusion to help you make sense out of the current state of your website. Mute Screamer can’t handle all types of attacks. But it could potentially help you figure out problematic areas on your website. It is worth installing if you are too worried about your site getting attacked.